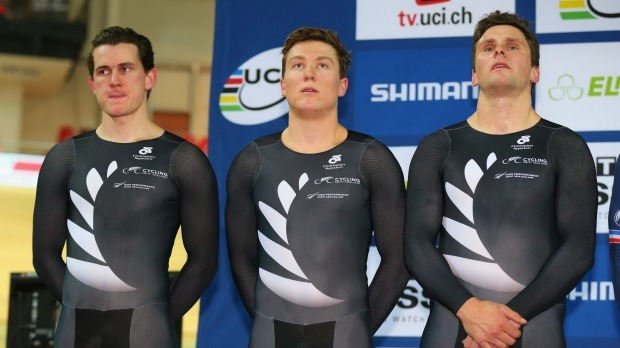 A dramatic demotion to the silver medal at the world championship will be just the motivation the New Zealand team sprint squad need to race for gold at the Rio Olympics, according to Southland's Edde Dawkins. The trio of Dawkins, Ethan Mitchell and Sam Webster were left broken hearted when they were relegated for an illegal change after beating the French in the gold medal final in Paris back in February. Since then Dawkins has had a well-deserved break from the saddle before ramping up his training over the past month or so. Edward Dawkins celebrates winning the silver medal in the keiren at the 2015 world track cycling championship in Paris. Memories of what went down at the Saint-Quentin-en-Yvelines velodrome are still a little raw, however. "It's alright. You win and lose races all the time - I've definitely lost more than I've won," Dawkins said. "I think it's a good thing, we know that we are the fastest team and with the perfect ride we would have won by a country mile. It's like we know that we would have won and we should have won, but it's a kick in the guts which means that we are going to push harder to be faster next time." The Commonwealth champions sill have plenty of improvement left in them between now and Rio, Dawkins said. "The team has grown hugely in strength and power - even in numbers, we have got five development and five core riders and everyone is pushing each other. Our competition within our programme is pushing each other to be better riders. We all know that only three riders can line up in August next year so it's definitely a team effort." The New Zealand sprint programme heads offshore next month for a 10-week block which will take them from the United States to Germany, Poland, Majorca and back to the United States. The idea is to investigate the ideal buildup to the Olympics. "We are trialling out the velodromes that we'll be training on, scheduling of the training and how it progresses our form." Dawkins is a lynchpin of the New Zealand sprint team these days, the rider charged with blasting his way around the final lap of the 750m team sprint. Competition within the squad, and the lure of Olympic gold, means that job fatigue is rare. "We all have those days, in every type of job, where you question why you are doing it. If you aren't questioning things and you are just blowing along just doing it then you'll never make any gains because you aren't willing to go through the hardship. Those hard days are when your team mates are so good. They give you a smack in the side of the head and tell you to get on with your job, they remind you why you are there and the good things about being part of this team."